Rafsanjani: "If the system reapproaches them they will come back to us"
TEHRAN, Iran (CNN) -- One of Iran's most powerful clerics, Ali Akbar Hashemi Rafsanjani, called Friday for the release of people arrested after last month's disputed presidential election. Rafsanjani remains an influential figure in Supreme Leader Ayatollah Ali Khamenei's circle. "There is no need to have these numbers of people in prison," the former Iranian president said during his highly anticipated Friday sermon. "Let them come back to their families. Let the enemy not laugh at us and criticize us. We must sympathize with those who have suffered damages." He warned: "The system cannot lose them. If the system reproaches them they will come back to us." Tens of thousands of people gathered in and around Tehran University as Rafsanjani spoke for about an hour, according to witnesses at the speech. Iranian police used tear gas to disperse some of the crowds. Many in the crowd chanted: "Iranians are dying and the nation will not tolerate it." Traditionally, the speaker before the sermon asks those gathered to yell "Death to America" and "Death to Israel." But on Friday, after being asked to curse those two countries, the crowd instead chanted, "Allaho Akbar," meaning "God is great" -- the signature chant of the opposition movement. It was a key moment of defiance, as thousands in the crowd signaled that they were there to protest, not to support the regime. Later, as Rafsanjani was speaking, he mentioned China and Russia -- two nations that have said they recognize Iranian President Mahmoud Ahmadinejad as the winner of the election. Some in the crowd began chanting, "Death to Russia" and "Death to China." 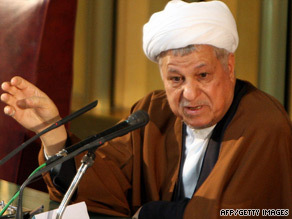 Rafsanjani called on the people to stop, saying they should not call for death to anyone. Moussavi was at the sermon Friday. The semi-official Islamic Student News Agency posted a photo of him in attendance. A Facebook page associated with Moussavi also said he was at the sermon. The news agency's photos also showed the two other opposition candidates from the election, Mehdi Karrubi and Mohsen Rezaie, at the sermon. There were reports, from people claiming to be witnesses, that Karrubi was attacked by members of the Basij, the paramilitary forces. CNN could not independently verify the reports because of the Iranian government's restrictions on international journalists. After weeks of silence, Rafsanjani recently became increasingly vocal in opposing the brutal crackdown on demonstrators who protested election results. Earlier this month, the Iranian Labor News Agency quoted him as saying: "People from across the county participated in the elections with excitement. But unfortunately, the events that occurred after that, and the difficulties created for some, left a bitter taste, and I don't think any wakened consciousness would be satisfied with the resulting situation." Rafsanjani was under pressure Friday to deliver public support for the Iranian establishment. Lawmaker Mohammad Karim Shahrzad was recently quoted by the state-run Islamic Republic News Agency as saying: "After a monthlong silence, the position of Hashemi Rafsanjani will be very important for those of all political inclinations, particularly those who are aiming at the (destruction) of the unity of the system." Shahrzad called on Rafsanjani -- head of the Assembly of Experts, the council responsible for appointing or removing the supreme leader -- to "announce the support of the supreme leadership as the highest authority" in his speech. A member of parliament said Rafsanjani's sermon would be "historic." Moussavi's supporters took to the streets last month to protest the outcome of last month's election that gave Ahmadinejad an overwhelming victory. Rafsanjani's daughter, Faezeh, and four of his other relatives were detained briefly after taking part in one of those rallies. The widespread street protests and civil unrest led to the deaths of at least 20 demonstrators and the arrests of more than 1,000, according to Iran's state-run media. The numbers of casualties and arrests could not be independently verified by CNN because of restrictions on international journalists by the Iranian government. Rafsanjani was missing when Iran's power brokers assembled on June 19 at Friday prayers to hear Khamenei declare Ahmadinejad the winner. Ahmadinejad is scheduled to be sworn in before parliament between August 2 and August 6, according to Islamic Republic News Agency .